A goal of this project is to connect fireballs and meteorites with the comet or asteroid of origin. This has only been done a few times, and in this modern digital age where many people own digital cameras and cell phones, there might be opportunity for improvement. Also, NASA and other space agencies spends millions sending spacecraft to comets and asteroids to study them and bring back pieces. It might help if a ragtag group of sky enthusiasts could make a difference on a much more modest budget and with existing technology. When a very bright meteor (dubbed a "fireball") is first reported somewhere in the world, someone should post this to the Asterisk as soon as possible with as much information as they can find, including as many informative links as they can find. This might include a TV report, for example, or comments to other bulletin boards. At this point, if the fireball is bright enough to be seen fortuitously in the background of images and videos taken for other purposes, one of the regulars on this forum should email me (RJN) that I should consider placing a "hook" about it on APOD. If I am awake, coherent, and agree, a "hook" will be placed at the bottom of the main NASA APOD page (astropix.html) asking for volunteers to spring into action. The purpose of the hook is to get as many people involved as possible. This may turn out to be one of the scientific attributes of APOD, leveraging APOD's role as a primary "watering hole" for sky enthusiasts for scientific ulitity. This whole process would do best taking place quickly, though. As time goes by, interest will wane, and sky recording devices that might have imaged the fireball will be erased or reset. Also, any meteorites on the ground may be lost or covered over. That is why the "48" exists in the FIREBALL48 title. In analogy with the US TV show "48 Hours", if fireball information is not uncovered quickly, perhaps in the first 48 hours since the fireball occurred, key information about the fireball might be lost forever. Quick actions might be very important. When a suitable Fireball occurs, a single leader for collecting information about this fireball on the Asterisk should volunteer or accept the position of "Fireball Leader". If the fireball occurred on 2010 November 26, for example, the person might be known as the "Fireball48 2010Nov26 Force Leader". The Fireball Leader will lead in the recovery of fireball information, for example making suggestions on the Asterisk as to how to best proceed for this particular fireball. The Fireball Leader may then try to recruit very specific individuals that could help gain crucial information about the fireball. Of course finding the approximate location of the fireball, and showing this on Google Maps (for example), would be a good early step. People would then try to estimate from what locations on Earth the fireball might have been seen. The language spoken in key towns would be important to know. The Fireball Leader would try to recruit by email someone to help that speaks the main language of the area. A Twitter search term might be coined so that people searching Twitter for tweets involving "#FB2010Nov26" could be found. People on the Asterisk would then use Google Maps and email to try to contact people and businesses in the fireball path would might have video of the fireball. Here Google Street View might be important. This might also include finding local online bulletin boards and posting requests there asking if anyone saw the fireball and if anyone has images or video. If anything appears in the local press, someone might post a response comment to the local story again asking if anyone has any information or video about the fireball. Efforts and responses would be echoed back to the Asterisk so that everyone, including the Fireball Leader, can be up to date. A local university might be contacted so that local students might get involved in tracking the fireball. These students might be deployed "door-to-door" checking local businesses for security cameras that might have seen the fireball in the background. It might be good for the Leader to request that someone local act as a 'Ground Leader" to coordinate local ground activities. If recovered, the exact position that the images were taken from would be important, as well as the exact times the images were taken. Later, these same students might enjoy checking key locations to see if the fireball produced any meteorites. Magnets might be immediately deployed along the path to try to catch metallic micrometeorites (if any) slowly flittering down from the fireball. Now the time noted on the image (EXIF data, for example) might exist but not be exact, so some effort might be devoted to determining the exact time of the images. One method is to find the camera and determine its present time offset from a standard clock, as well as how fast that clock gets out of synch. If more than one photograph and video are recovered, the Fireball Leader might then contact someone skilled in celestial mechanics to see if there is sufficient information to determine the fireballs origin on the sky and destination on the ground (if any). This celestial mechanic might indicate that additional images taken in a very certain time period would be particularly important to find for reconstructing 3D meteor trajectory information. If other groups are found trying to do the same thing, information about them should be posted to the Asterisk, and any information our FIREBALL48 network gains should be shared with them as well. A few fireballs a year seem to be popping up in the past few years, some of them even discussed informally here on the Asterisk. I've had the (unrealistic) dream of (one day) dropping everything and immediately traveling to fireball locations and trying to cull the needed trajectory information. Now, however, I think much of this can be better done by a group of savvy sky enthusiasts over the Internet, and by recruiting people local to the fireball. Thoughts? Tweeks? Would anyone be interested in playing along? Was this a fireball? Should we start a trial run of the FIREBALL48 Meteor Investigation Network? Any takers? That is a contrail, catching the Sun (which has set at ground level). Note the second contrail as a jet comes in from the right- with exactly the same color. A handful of videos like this show up every year. It is definitely not a fireball. Chris Peterson wrote: That is a contrail, catching the Sun (which has set at ground level). Note the second contrail as a jet comes in from the right- with exactly the same color. A handful of videos like this show up every year. It is definitely not a fireball. OK. Thanks Chris. False alarm everyone. Cancel yellow alert. Reported by on Facebook by my friend and amateur astrophotographer Kevin Davis. Well coming home from work 2:43am this morning, I noticed what I thought was police helicopter light making shadows of the over head sign-age dance on the interstate I looked up for the helicopter only to see a bright bolide meteor streaking across the sky with greens and purple colors coming from the east to west about 47 deg long. About 10 degs after it crossed zenith the meteor broke up into smaller fragments and each smaller fragment continued to break apart leaving what looked like the trails of a spent firework. Awesome site to see. I'll try to get more particulars. In my current opinion, this was unlikely to be a fireball, but it may be interesting for FIREBALL48ers to try figuring out what it really was. Another reason for posting this here as a yellow alert is to keep this FIREBALL48 network from becoming stale. I am a bit surprised that no fireballs have been reported since 2011 March, and expected this network to be more active. Please remember that all posts to this topic result in an email being sent to its subscribers. Therefore, please post your thoughts on the recent Mauna Kea transient to the above discussion link and not here. Is this a real fireball? If so, given the language barrier, is this worth trying to figure out where it might have come from and where on Earth it might have been headed? RJN wrote: Is this a real fireball? No, it's a jet contrail illuminated by the Sun below the horizon. An actual fireball would be white hot at its head, would leave a dusty smoke trail, would be moving much faster, and wouldn't be bifurcated (this was almost certainly a twin engine jet). Phil agrees with Chris. That was my gut reaction, too, when I first saw the video (easy to say now). <<The Ferrara Pan Candy Company is a Chicago and Forest Park, Illinois, based candy company that makes a variety of popular candies. Their popular confections include Lemonheads, Jaw busters ("The Original Jaw Breakers"), Atomic Fireballs, Chewy Fireballs, Original Boston Baked Beans, Grapeheads (formerly Alexander the Grape), Apple Heads, Punch Heads, Orange Heads, Cherry Heads, Chewy Lemon Heads & Friends, Tropical Chewy Lemon Heads & Friends and Red Hots. According to the Ferrara Pan Candy Company website, the company was founded in 1908 by Salvatore Ferrara, Salvatore Buffardi and Anello Pagano. The company is located on the outskirts of Chicago at 7301 W. Harrison St., Forest Park, Illinois. It continues to be owned by the Ferrara, Buffardi, and Pagano families. Originally, Ferrara Pan developed and sold sugar-coated almonds or confetti as they are called in Italy. Shize? I should shee! Macool, Macool, orra whyi deed ye diie? shoutmost shoviality. Agog and magog and the round of them agrog. Atomic Fireballs (known as Atomic FireBlast in the UK) are a round, cinnamon-flavored hard candy invented by Nello Ferrara in 1954. They are a form of jawbreaker. The outer layers of the candy are a bright red color while the interior layers are white. When initially introduced by Ferrara Pan, the company had a manufacturing capacity of 200 cases per day but demand quickly rose to 50,000 cases per day. According to the company, approximately 15 million Fireballs are eaten weekly. "The spicy flavor and the exceptionally long lasting candy was instantly popular (coupled with the popular culture obsession with all things atomic at the time). The outside layer of the Fireball is quite mild. After a moment in the mouth, the smooth ball of hard candy releases an intense spicy cinnamon flavor. Capsaicin is the ingredient found in the Atomic Fireball that causes the burning sensation. They are made with the hot panned process with ingredients of a single grain of sugar, syrup and flavor. The hot pans tumble the ingredients around until the fireballs snowball into the appropriate size. The process lasts for about two weeks. By the end of the process the fireball consists of at least one hundred layers. The fireballs come in two sizes, a pea size and the more popular full-size (7/8ths of an inch in diameter) which comes individually wrapped. Last edited by neufer on Thu Sep 15, 2011 6:26 pm, edited 1 time in total. Thanks, bystander! I have looked at the news reports and am not really sure what this is. Still, there are numerous reports of it being very bright, and so I am going to bump it up to a "Yellow Alert" and start a new thread discussing it. That thread is here: http://asterisk.apod.com/viewtopic.php?f=32&t=25270 . I will also put a hook link on APOD asking for images or personal accounts. Also, please let's try to keep this thread free of humorous trivia so that we can concentrate on tracking this thing and things like this. Thanks, bystander -- good catch! This does indeed appear to be a real fireball. It seems, though, that a Canadian team already has a trajectory from their stations that saw the event. I therefore don't know if there is any way that we can help out. I am not sure that identifying the fireball on security cameras would result in a better orbit. If people disagree please do respond. Twitter is all abuzz with sightings of a huge fireball meteor that streaked across the skies Friday night at approximately 22:00 UTC. There are reports from Northern Ireland, Scotland, and Central England. 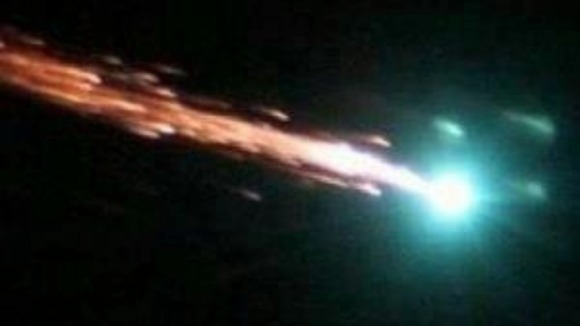 <<Police were inundated with reports of "fireballs in the sky" last night as a large meteor lit up the sky across the Midlands. Many people mistook the meteor for aircraft or something more sinister and contacted the police reporting fireballs or 'suspicious lights in the sky'. There’s been a bit more news on that amazingly bright and weird fireball seen moving across the skies of northern UK last week. Marco Langbroek is a paleolithic archaeologist in Amsterdam, and also an amateur satellite tracker – though with modern tech, the term "amateur" is arguable. Anyway, he’s been looking at the track and velocity of the meteor using eyewitness accounts (and the video taken), and thinks he can rule out the cause being the re-entry of human-made debris from a spacecraft. In fact, he thinks the meteoroid (the term for the actual object responsible for the light show) was an Aten asteroid: part of a class of rocks that orbit the Sun on paths that tend to keep them inside Earth’s orbit*. The key issues here are the slow speed it moved across the sky, and the fact it moved east-to-west. That last part is really important: very few satellites orbit retrograde, or in that direction. Most orbit either prograde – west-to-east, the same direction the Earth spins and also the same direction it orbits the Sun – or in polar orbits (north/south). So right away that makes it unlikely the meteor was from a spacecraft. However, what has me scratching my head is the slow speed of the meteor. A rock orbiting the Sun retrograde means its velocity will add to the Earth’s, making it move faster as it burns up, not slower. It’s like two cars in a head-on collision; if each is moving 100 km/hr then the resulting collision speed is 200 km/hr relative to either car. You get slower relative collisions if they’re moving in the same direction; they’ll merely bump at low speed relative to one another. We see this with meteors; the Leonid meteor shower, for example, is made up of tiny particles that move almost in the opposite direction of the Earth, and when they burn up in our atmosphere they move extremely rapidly across the sky. The collision speeds can be 70 kilometers per second! So why was this meteor over the UK moving so slowly if it were an Aten? Marco thinks he has the answer to that. If the asteroid happened to be at aphelion – the top of its orbit, when it’s farthest from the Sun, also when moving most slowly and in a direction nearly parallel with that of the Earth – it would all add up. The backwards direction and the slow motion would be a natural consequence of this. I’ll note that as far as I have thought about this, I agree with Marco. It’s not conclusive yet, though, but it’s compelling. Meteors like this are rare. One that gets this bright, is seen by so many people, and drops bits of itself as it burns up are rare enough (the Peekskill meteor in 1992 is the best example of this), but one moving retrograde is even weirder. If Marco is right then I hope even more people submit their observations, pictures, and videos to the International Meteor Organization website. Those observations can help scientists determine the orbit of the object more accurately, and help pin down exactly what the heck this crazy object was. A boulder-sized asteroid designated 2018 LA was discovered Saturday morning, June 2, and was determined to be on a collision course with Earth, with impact just hours away. Because it was very faint, the asteroid was estimated to be only about 6 feet (2 meters) across, which is small enough that it was expected to safely disintegrate in Earth’s atmosphere. Saturday’s asteroid was first discovered by the NASA-funded Catalina Sky Survey, located near Tucson and operated by the University of Arizona. A meteorite was found in Botswana’s Central Kalahari Game Reserve (CKGR) that is a fragment of asteroid 2018 LA. This small asteroid was discovered in space by the University of Arizona's Catalina Sky Survey on June 2, 2018, eight hours before hitting Earth. A multinational team of scientists has just found the first fragments of the small asteroid 2018 LA, which exploded harmlessly high above Africa on June 2. The University of Hawaii’s Asteroid Terrestrial-Impact Last Alert System (ATLAS) telescope took the final images of 2018 LA before it entered Earth’s atmosphere and exploded. Although 2018 LA was discovered by a different telescope in Arizona, ATLAS played a crucial role in determining the asteroid’s final destination. Prior to the ATLAS measurement, impact predictions showed 2018 LA hitting the Earth anywhere from Madagascar to the South Pacific -- a range spanning almost half Earth’s southern hemisphere. By measuring the asteroid more than 2 hours after it was last seen from Arizona, and less than 5 hours before it exploded, ATLAS greatly improved the accuracy with which the pre-impact orbit could be calculated, helping to prove the bright meteor subsequently seen over Botswana was indeed the fiery demise of 2018 LA.